Highest point: Mount Marcy is the highest peak in New York State, with an elevation of 5,344 ft. Standing 5344 feet above sea level, in the Adirondacks and the highest mountain in New York State. The U.S. State of New York has been known by many nicknames, the most notable of which is The Empire State. A number of presidents have been closely associated with the history of New York State, including Martin Van Buren, Millard Fillmore, Chester Arthur, Grover Cleveland, Theodore Roosevelt and Franklin D. Roosevelt. In 1624 the first permanent Dutch settlement was established at Fort Orange, now Albany. In 1973, on a New York City street, Motorola researcher Martin Cooper made the first public call on a handheld mobile phone. The first railroad in America ran between Albany and Schenectady, a distance of 11 miles. There are four mountain ranges in New York State: Adirondack, Catskill, Shawangunk and Taconic. The highest point in New York State is Mount Marcy, Essex County in the Adirondacks - 5,344 feet above sea level. The state of New York is located within the Northeastern area of the United States and is the 27th ranked most extensive state with a total land area of roughly 54,556 square miles, and it is the 3rd ranked most populated state with a population of 19.47 million people. 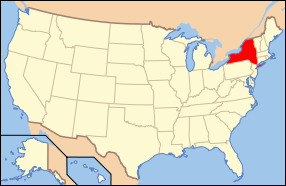 New York is bordered by Pennsylvania and New Jersey to its south, Massachusetts, Vermont, and Connecticut to its east, Rhode Island and Ontario remain its other borders. New York City is the most populated city in the country with over 8.1 million people, however the state capital is the city of Albany. In early times, the land where New York presently sits was occupied by several tribes such as the Iroquoian and Algonquian. It wasn't until July of 1788 when New York officially became the 11th state to ratify the U.S. Constitution. The geography of the state is largely compromised of the Appalachian Valley. Most of the southern region of New York is situated on the Allegheny Plateau. The climate in New York is typically recognized as a humid continental climate, however it is also regarded as a humid subtropical climate. The weather in the region is largely influenced by two different continental air masses, a warm and humid one from the southwest and a colder dry one from on the northwest. New York as many large industries with the main ones being finance, international trading, publishing, communications, fashion, fruit and dairy farming, and tourism. Four different presidents were born in the state of new York; Martin Van Buren, Millard Fillmore, Theodore Roosevelt, and Franklin Delano Roosevelt. The main bodies of water in the state of New York are the Mohawk River, Genesee River, and the Hudson River. The highest point of elevation is Mt. Marcy which top out at 5,344 feet above sea level. New York is also bordered by several large bodies of water including Lake Erie, Lake Ontario, Lake Champlain, and the Atlantic Ocean. The state bird is the Eastern Bluebird, the state fish is the Brook Trout, the state flower is the rose, and the state tree is the Sugar Maple Tree. New York has a thriving city life and one of the biggest cities in the world, easily making it one of the most important states in the United States. The term "The Big Apple" was coined by touring jazz musicians of the 1930s who used the slang expression "apple" for any town or city. Therefore, to play New York City is to play the big time - "The Big Apple". "Uncle Sam" was a meat packer from Troy, NY. During the War of 1812, Sam Wilson stamped "U.S. Beef" on his products and soldiers interpreted that as Uncle Sam.